Prague has an ethereal, dreamy tone to it at times. 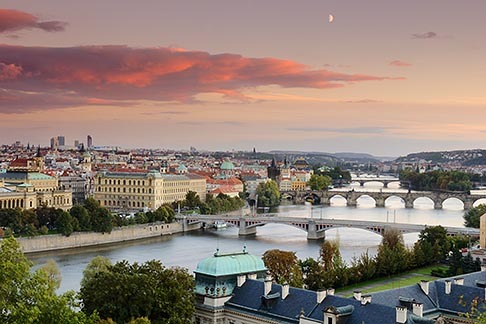 The cobbled streets, the restrained excitement of the crowds, the busy shopping streets, and yet an understated satisfaction at simply being a new, brisk and energetic European city. In the summer is is bustling. full of movement. Yet after sunset, when the hawkers leave the Charles Bridge and the trams have carried the commuters home, a quiet settles on the Vlatava River. The same quiet deepens until the still hour before sunrise. To get an overview of the river with the full moon over the rooftops, I climbed the ramparts of the park opposite Hradcany castle. The pink glow came and went quickly. It always does..